Excerpt: 'Dangerous Games' In this stimulating book, Oxford professor Margaret MacMillan exposes politicized manipulations of history and argues for the necessity of accurate understandings of the past. Museums and art galleries mount huge shows around historical characters like Peter the Great or on specific periods in history. Around the world, new museums open every year to commemorate moments, often grim ones, from the past. China has museums devoted to Japanese atrocities committed during World War II. Washington, Jerusalem, and Montreal have Holocaust museums. Television has channels devoted entirely to history (often, it must be said, showing a past that seems to be made up largely of battles and the biographies of generals); historic sites are wilting under the tramp of tourists; history movies--think of all the recent ones on Queen Elizabeth I alone--are making money; and the proliferation of popular histories shows that publishers have a good idea of where profits are to be made. Ken Burns's documentaries, from the classic Civil War series to his one on World War II, are aired repeatedly. In Canada, Mark Starowicz's People's History drew millions of viewers. The Historica Minutes produced by the private foundation Historica, devoted to promoting Canadian history, are so popular among Canadian teenagers that they often do school projects where they make their own minutes. In the United Kingdom, David Starkey's series on British monarchs have made him rich and as famous as the kings and queens themselves. Many governments now have special departments devoted to commemorating the past--or, as it is often grandly designated, "heritage." In Canada, the Department of Canadian Heritage exhorts Canadians to learn about Canada's history, culture, and land: "Heritage is our collective treasure, given to us and ours to bequeath to our children." The term can encompass virtually anything: language, folk dances, recipes, antiques, paintings, customs, buildings. There are societies to celebrate antique cars or guns, baseball cards or matchboxes. In England, a young architect has founded the Chimneypot Preservation and Protection Society to save, as its mission decrees, "the Sentinels of Time." France, which has had a particularly active Ministry of Culture for decades, declared 1980 the Annee du Patrimoine. Locals dressed up to reenact the great moments of their history. In the following years, the number of heritage sites and monuments on the official list doubled. Scores of new museums--devoted to the wooden shoe, for example, or the chestnut forest--appeared. At the end of the decade, the government set up a special commission to oversee the commemoration of the two-hundredth anniversary of the French Revolution in 1989. In France there has been an explosion of reenactments of the past, festivals, and special months, weeks, and days. The possibilities, of course, are endless: the starts and ends of wars, the births and deaths of famous people, the first publication of a book or the first performance of an opera, a strike, a demonstration, a trial, a revolution, even natural disasters. And the activity is not all government inspired; much comes from local and volunteer initiatives. Chalons-sur-Marne recognized the centenary of the invention of canning. It is not just in France that communities want to revisit their past: Perth, Ontario, had a week of festivities in 1993 to celebrate the giant cheese that it sent to the World's Fair in Chicago in 1893. As enterprising local governments and businesses have realized, the past is also good for tourism. Governments tend to assume that proper attention and care of the past will do the present good. In the United States, the National Historic Preservation Act assumes that a sense of the past will help make good Americans. The nation's heritage must be preserved, it says, "in order to give a sense of orientation to the American people." President George W. Bush's executive order of 2003 titled "Preserve America" echoed that sentiment: "The Federal Government shall recognize and manage the historic properties in its ownership as assets that can support department and agency missions while contributing to the vitality and economic well-being of the Nation's communities and fostering a broader appreciation for the development of the United States and its underlying values." The passion for the past is clearly about more than market forces or government policies. History responds to a variety of needs, from greater understanding of ourselves and our world to answers about what to do. For many human beings, an interest in the past starts with themselves. That is in part a result of biology. Like other creatures, humans have a beginning and an ending, and in between lies their story. It probably also has to do with the realization that today the great majority of people live in a rapidly changing world where long-standing relationships that were once taken for granted--whether with places or with people such as family or friends--no longer exist for many. Part of the current fascination with preserving heritage comes from the fear that we are losing priceless and irreplaceable pieces of the past, whether they are dying languages or decaying buildings. Sometimes the preservationists seem to want time itself to stand still. In New York, to take a current debate, should the tenements of the Lower East Side be replaced by modern, more salubrious buildings? Or should they be kept, as a spokeswoman for the Tenement Museum said, "to remind us of the experience lived and worked inside them"? Nineteen million people around the world are now signed up to the online Friends Reunited, which will put you in touch with long-lost friends from the distant past, even from your earliest school days. If anyone wants to go still further back, and an increasing number of people do, he or she can research genealogies. It is understandable, said a spokesman for the College of Arms in London, "in a throwaway society where everything is ephemeral." Most national archives now have special sections set aside for patrons who are investigating their family histories. Thanks to the Mormons, who collect parish registers, genealogies, and birth records for their own purposes, Salt Lake City houses an enormous worldwide collection of records. The Internet has made it even easier, with dozens of sites where you can search for your ancestors, with more specialized ones dedicated to a single family name. In Canada and the United Kingdom, the popular television show Who Do You Think You Are? caters to our fascination with celebrities and the hunt for ancestors as it traces back, often with surprising results, the family trees of the famous. Recent developments in science make it possible to go beyond the printed records. The decoding of DNA means that scientists can now trace an individual's ancestry back through the mother's line and can find others with the same genetic makeup. As the databases of information build up, it becomes increasingly possible to see how human beings have migrated over the years. This is important for anyone who wants to go back beyond where the paper trail peters out. It is particularly important for those who never had much of a paper trail to begin with. Those immigrants who came in great waves to the New World in the nineteenth and twentieth centuries to escape a miserable and uncertain life in Europe often lost all links with their pasts, sometimes indeed even their old names. For the descendants of American slaves, who lacked even the faintest hope of recovering the path their ancestors followed from Africa and not much more chance of finding out what happened to them once they were in the United States, DNA has suddenly opened the door to self-knowledge. A moving program called African American Lives, which was broadcast by PBS in 2006, looked at the DNA of famous black Americans, Oprah Winfrey and Quincy Jones among them. Sometimes the results are disappointing: family stories about the great-grandparent who was descended from kings are often just that--stories. Sometimes there are surprises, as when an obscure professor of accounting in Florida found he was descended from Genghis Khan. Perhaps, thought the professor, he owed his administrative skills to his terrifying ancestor. The current fascination for people's personal histories can be narcissistic--how much time should human beings spend gazing at themselves, after all?--but it also comes from the desire to know more about what made people who they are and what made the world in which they happen to live. If people can stand back and see their own histories in a wider perspective, then they can see how they are the products not just of particular individuals but of whole societies and cultures. Members of certain ethnic groups may find that they have inherited views on other ethnic groups, and may also find that others regard them in particular ways. History has shaped humans' values, their fears, their aspirations, their loves, and their hatreds. When we start to realize that, we begin to understand something of the power of the past. Even when people think they are striking out in new directions, their models often come from the past. How often have we seen revolutionaries, committed to building new worlds, slip back unconsciously into the habits and ways of those they have replaced? Napoleon came to power as the result of the French Revolution, but the court he set up was modeled on that of the displaced Bourbons. The top Soviet Communists lived within the walls of the Kremlin, as the czars had once done. Stalin looked back to Ivan the Terrible and Peter the Great as his predecessors, as, I suspect, Vladimir Putin did when he was president. The Chinese Communists scorned China's traditional society, but their top leaders chose to live right at the heart of Beijing, where the imperial court had once been. Mao Zedong himself withdrew into mysterious seclusion, much as the emperors had done over the centuries. "Men make their own history," said Karl Marx, "but they do not make it as they please: they do not make it under self-selected circumstances, but under circumstances existing already, given and transmitted from the past." During the Cold War, though, history appeared to have lost much of its old power. The world that came into being after 1945 was divided up between two great alliance systems and two competing ideologies, both of which claimed to represent the future of humanity. American liberal capitalism and Soviet-style Communism were about, so they said, building new societies, perhaps even new human beings. The old conflicts, between Serbs and Croats, Germans and French, or Christians and Muslims, were just that and were consigned, in Leon Trotsky's memorable phrase, to the dustbin of history. The threat of massive nuclear war, of course, was always present, and from time to time, during the Cuban missile crisis in 1962, it looked as if the last moment of the planet had come. But it did not, and in the end most of us simply forgot about the danger. Nuclear weapons took on a benign aspect: after all, the balance of terror meant that neither superpower dared attack the other without risking its own destruction. People at the time assumed that the United States and the Soviet Union would remain locked in their conflict, between war and peace, perhaps forever. In the meantime, the developed world enjoyed unparalleled prosperity, and new economic powers, many in Asia, appeared on the scene. My students used to tell me how lucky I was to be teaching history. Once you have got a period or the events of a war straight, so they assumed, you don't have to think about them again. It must be so nice, they would say, not to redo your lecture notes. The past, after all, is the past. It cannot be changed. History, they seemed to say, is no more demanding than digging a stone out of the ground. It can be fun to do but not really necessary. What does it matter what happened then? This is now. When the Cold War abruptly ended in 1989 with the collapse of the Soviet Empire in Europe, the world enjoyed a brief, much too brief, period of optimism. Collectively, it failed to recognize that the certainties of the post-1945 years had been replaced by a more complicated international order. Instead, most people assumed that as the remaining superpower, the United States would surely become a benevolent hegemon. Societies would benefit from a "peace dividend" because there would be no more need to spend huge amounts on the military. Liberal democracy had triumphed and Marxism itself had gone into the dustbin. History, as Francis Fukuyama put it, had come to an end, and a contented, prosperous, and peaceful world was moving into the next millennium. In fact, many of the old conflicts and tensions remained, frozen into place just under the surface of the Cold War. The end of that great struggle brought a thaw, and long-suppressed dreams and hatreds bubbled to the surface again. Saddam Hussein's Iraq invaded Kuwait, basing its claims on dubious history. We discovered that it mattered that Serbs and Croats had many historical reasons to fear and hate each other, and that there were peoples within the Soviet Union who had their own proud histories and who wanted their independence. Many of us had to learn who the Serbs and Croats were and where Armenia or Georgia lay on the map. In the words of the title of Misha Glenny's book on central Europe, we witnessed the rebirth of history. Of course, as so often happens, some people went too far the other way and blamed everything that was going wrong in the Balkans in the 1990s, to take one of the most egregious cases, on "age-old hatreds," which conveniently overlooked the wickedness of Slobodan Milosevic, then the president, and his ilk, who were doing their best to destroy Yugoslavia and dismember Bosnia. Such an attitude allowed outside powers to stand by wringing their hands helplessly for far too long. The last two decades have been troubled and bewildering ones, and, not surprisingly, many people have turned to history to try to understand what is going on. Books on the history of the Balkans sold well as Yugoslavia fell to pieces. Today, publishers are rushing to commission histories of Iraq or to reissue older works. T. E. Lawrence's Seven Pillars of Wisdom, which describes the Arab struggle against Turkey for independence, is a bestseller again, and particularly popular with American soldiers serving in Iraq. My own book on the Paris Peace Conference of 1919, where so much of the foundation of the modern world was laid, could not find a publisher in the 1980s. As one publisher said, no one wanted to read about a bunch of dead white men sitting around talking about long-forgotten peace settlements. By the 1990s, the subject had come to seem a lot more relevant. Today's world is far removed from the stasis of the Cold War. It looks more like that of the decade before 1914 and the outbreak of World War I or the world of the 1920s. In those days, as the British Empire started to weaken and other powers, from Germany to Japan to the United States, challenged it for hegemony, the international system became unstable. Today, the United States still towers over the other powers but not as much as it once did. It has been badly damaged by its involvement in Iraq, and it faces challenges from the rising Asian powers of China and India and its old rival Russia. Economic troubles bring, as they brought in the past, domestic pressures for protection and trade barriers. Ideologies--then Fascism and Communism, now religious fundamentalisms--challenge the assumptions of liberal internationalism and wage war on powers they see standing in their way. And the world still has, as it had in the first half of the twentieth century, the unreasoning forces of ethnic nationalism. 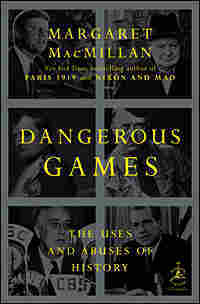 Excerpted from DANGEROUS GAMES by Margaret MacMillan Copyright 2009 by Margaret MacMillan. Excerpted by permission of Random House Group, a division of Random House, Inc. All rights reserved. No part of this excerpt may be reproduced or reprinted without permission in writing from the publisher.